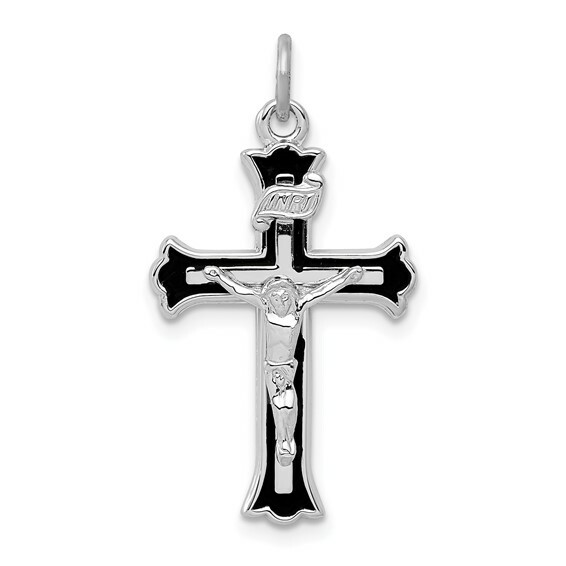 Sterling silver INRI crucifix pendant features black enamel. Weight: 1.7 grams. Measures 1 inch tall by 5/8 inches wide without bail. This item is the size of a quarter. Wear it every day - has a very classic and clean look. Stunning!!! This was a perfect gift. Quality was the best I obtained for quite|some time. The gift was prized. Thank you. I wear this crucifix all day every day. It is light weight and beautiful. The size is perfect for all day wear or any time.